An object that links two different types of neutron star has been found. IGR J18245 displays behaviors of both a "low-mass X-ray binary" and a "millisecond pulsar". X-ray and radio observations were used to supply evidence for this never-before-seen transition between these two states. Pulsars are the extremely dense spinning cores of collapsed stars. 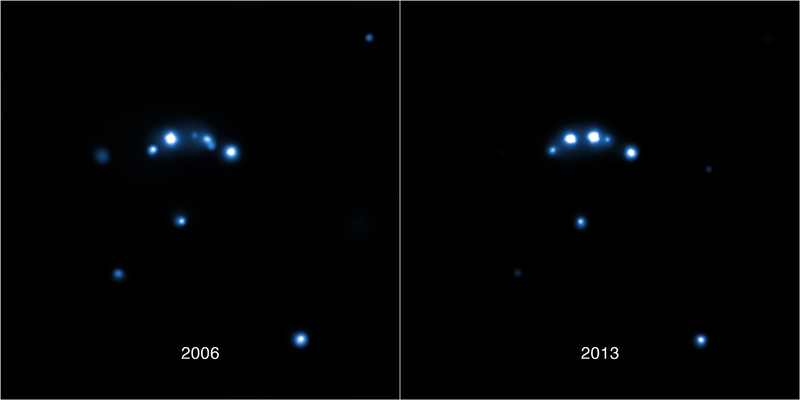 These two images from NASA's Chandra X-ray Observatory show a large change in X-ray brightness of a rapidly rotating neutron star, or pulsar, between 2006 and 2013. The neutron star - the extremely dense remnant left behind by a supernova - is in a tight orbit around a low mass star. 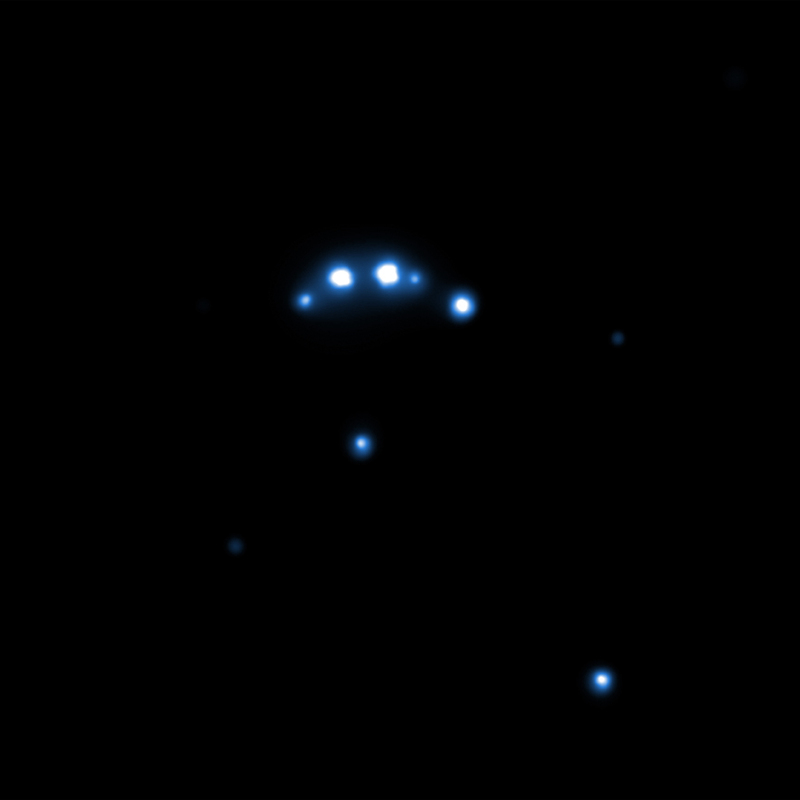 This binary star system, IGR J18245-2452 (mouse over the image for its location) is a member of the globular cluster M28. As described in a press release from the European Space Agency, IGR J18245-2452 provides important information about the evolution of pulsars in binary systems. Pulses of radio waves have been observed from the neutron star as it makes a complete rotation every 3.93 milliseconds (an astonishing rate of 254 times every second), identifying it as a "millisecond pulsar." The widely accepted model for the evolution of these objects is that matter is pulled from the companion star onto the surface of the neutron star via a disk surrounding it. During this so-called accretion phase, the system is described as a low-mass X-ray binary because bright X-ray emission from the disk is observed. Spinning material in the disk falls onto the neutron star, increasing its rotation rate. The transfer of matter eventually slows down and the remaining material is swept away by the whirling magnetic field of the neutron star as a millisecond radio pulsar forms. The complete evolution of a low-mass X-ray binary into a millisecond pulsar should happen over several billion years, but in the course of this evolution, the system might switch rapidly between these two states. The source IGR J18245-2452 provides the first direct evidence for such drastic changes in behavior. In observations from July 2002 to May 2013 there are periods when it acts like an X-ray binary and the radio pulses disappear, and there are times when it switches off as an X-ray binary and the radio pulses turn on. The latest observations with both X-ray and radio telescopes show that the transitions between an X-ray binary and a radio pulsar can take place in both directions and on a time scale that is shorter than expected, maybe only a few days. They also provide powerful evidence for an evolutionary link between X-ray binaries and radio millisecond pulsars. The X-ray observations contained data from Chandra, ESA's XMM-Newton, the International Gamma-Ray Astrophysics Laboratory (INTEGRAL) and NASA's Swift/XRT and the radio observations used the Australia Telescope Compact Array, the Green Bank Telescope, Parkes radio telescope and the Westerbok Synthesis Radio Telescope. The observations of IGR J18245-2452 and their implications are described in a paper published in the September 26th, 2013 issue of Nature. The first author is Alessandro Papitto from the Institute of Space Sciences in Barcelona, Spain. The co-authors are C. Ferrigno and E. Bozzo from Université de Genève, Versoix, Switzerland; N. Rea from the Institute of Space Sciences in Barcelona, Spain; L. Pavan from Université de Genève, Versoix, Switzerland; L. Burderi from Universit´a di Cagliari, Monserrato, Italy; M. Burgay from INAF-Osservatorio Astronomico di Cagliari, Capoterra, Italy; S. Campana from INAF-Osservatorio Astronomico di Brera, Lecco, Italy; T. Di Salvo from Universit´a di Palermo, Palermo, Italy; M. Falanga from International Space Science Institute, Bern, Switzerland; M. Filipovi´c from University of Western Sydney, Penrith, Australia; P. Freire from Max-Planck-Institut f´ur Radioastronomie, Bonn, Germany; J. Hessels from Netherlands Institute for Radio Astronomy, Dwingeloo, The Netherlands; A. Possenti from INAF-Osservatorio Astronomico di Cagliari, Capoterra, Italy; S. Ransom from National Radio Astronomy Observatory, Charlottesville, VA; A. Riggio from Universit´a di Cagliari, Monserrato, Italy; P. Romano from INAF-Istituto di Astrosica Spaziale e Fisica Cosmica, Palermo, Italy; J. Sarkissian from CSIRO Astronomy and Space Science, Epping, Australia; I. Stairs from University of British Columbia, Vancouver, Canada; L. Stella from INAF-Osservatorio Astronomico di Roma, Roma, Italy; D. Torres from the Institute of Space Sciences in Barcelona, Spain; M. Wieringa from CSIRO Astronomy and Space Science, Narrabri, Australia and G. Wong from University of Western Sydney, Penrith, Australia. Coordinates (J2000) RA 18h 24m 32.00s | Dec -24° 52' 10.70"
Observation Time 26 (1 day, 2 hours). Imagine spinning this fast for billions of years, these pulsars are tough! A binary system that includes a pulsar located about 18,000 light years from Earth. About 6 light years across. In the constellation Sagittarius visible in both hemispheres.